holy wow, 2009 was beautiful! on this, the last day of the year, we are fondly remembering wonderful times and looking forward to what will be. happy new year, friends! thank you so much for sharing this special space with me throughout the year. one more handmade holiday post, folks! 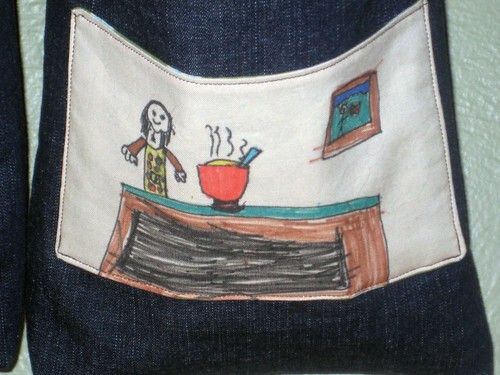 these are the wall pockets that we made with esme's artwork on the front pockets. 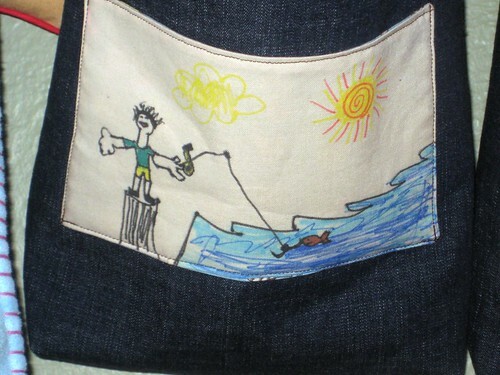 grandpa is fishing and grandma is cooking oatmeal in a super cute apron! my favorite detail is that framed photo on the wall behind grandma... it is grandpa posing with his fish! now that our handmade holiday has come to an end i plan to stitch up a wall pocket for everyone in the house! it will fit right in with the declutter season that is upon us, no? you can find the free wall pocket tutorial here. 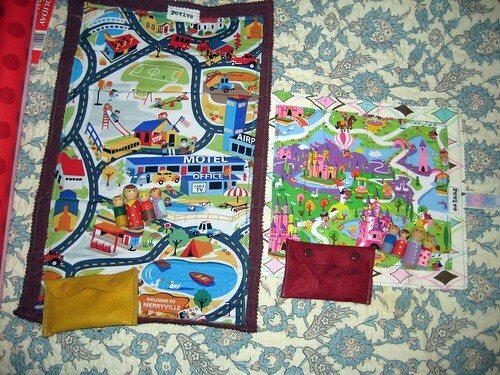 i supplied esmé with squares of muslin and fabric markers for the embellished pockets. 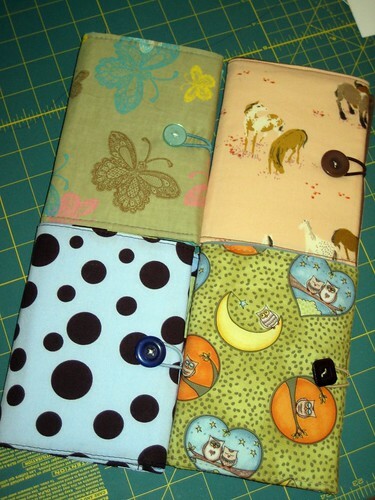 i use some cotton webbing for the hanging loops on these pockets - quick and easy! and oh, so cute! wool sleep sacks are wonderful for new cloth diapered babies and make night time diaper changes a breeze! 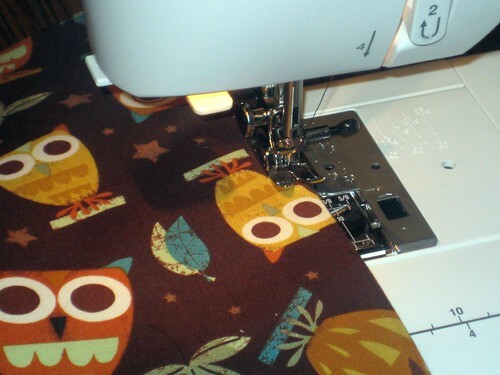 this faux cable pattern creates a lovely thick and stretchy fabric, perfect for diaper covers. i have been knitting sleep sacks in preparation for our new baby and thought i would share this pattern that i have developed. enjoy! 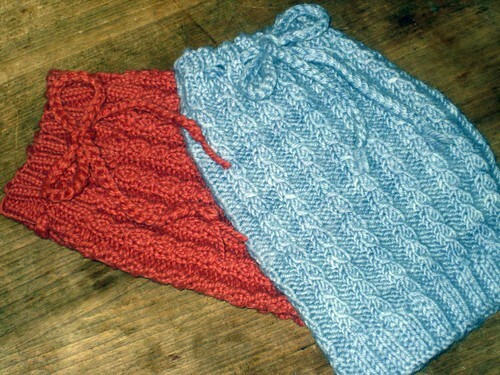 100% wool yarn- i like to use nice, sturdy yarn. 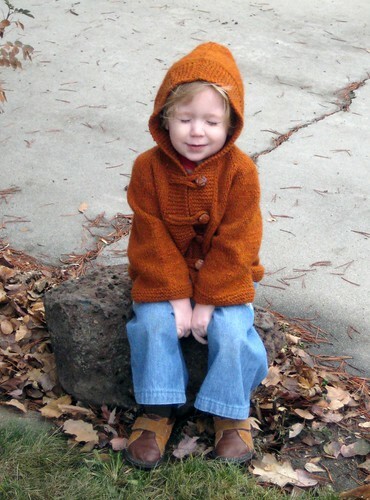 wool that will work well for this pattern are cestari merino (terra cotta sleep sack in photo), araucania nature wool (lavender sleep sack in photo), cascade eco, or something similar. if you are using a thinner weight yarn you may need to use a smaller needle size. approx. 200 yards is needed. co 80 stitches using size 5 needles, place marker and join in the round being careful to not twist your stitches. knit 2 x 2 ribbing for 1.5 inches. eyelet row- *k2tog, yo, p2* repeat from * to end of row. continue to knit 2 x 2 ribbing for another 1.5 inches. row 1: *k3, p2*repeat from * to end of row. row 2: *k3, p2* repeat from * to end of row. row 3: *sl1, k2, psso, p2* repeat from * to end of row. row 4: *k1, yo, k1, p2* repeat from * to end of row. continue knitting these 4 rows until your piece measures 11 inches from the co.
switch back to your size 5 needles and knit 2 x 2 ribbing for 2 inches. cast off loosely- you might want to cast off with your larger needles to ensure the bottom of the sleep sack is stretchy enough to pull up for diaper changes. 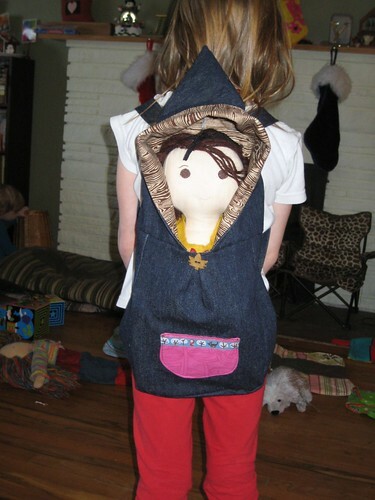 drawstring :: you can use any preferred method to make your drawstring. i like to make a crochet chain holding 2 strands of yarn together. 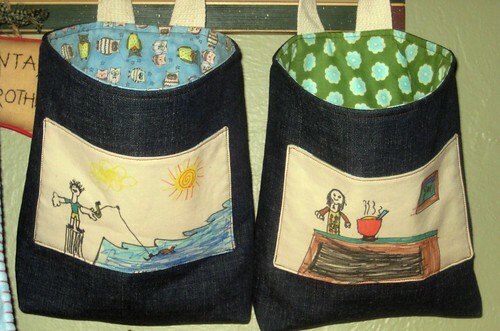 using 2 different colors makes a fun drawstring! now you are ready to wash, lanolize and use your sleep sack on your sweet baby! 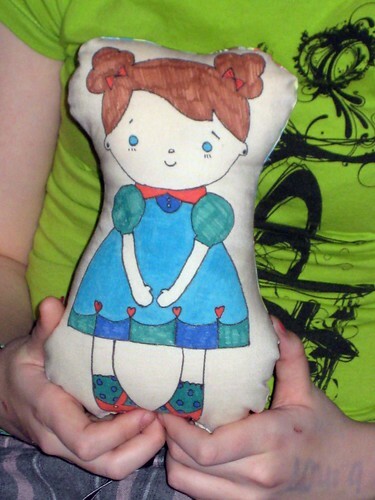 notes :: if you would like to modify this pattern to make a smaller or bigger sleep sack, no problem! first of all your cast on number should always be an even number for the 2 x 2 ribbing. 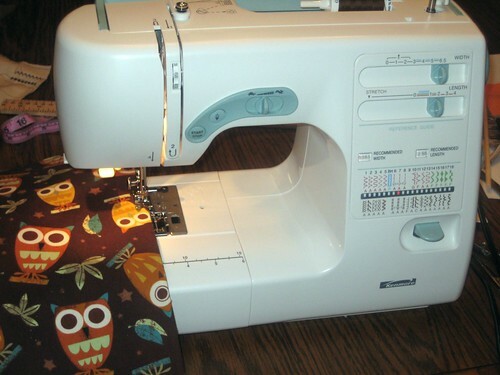 then, you need to divide that number by 4 and make sure that again, you get an even number- this will be the number of drawstring eyelets you will end up with. if you have an odd number of eyelets you will not be able to thread your drawstring properly. after the top ribbing increase 3 sts evenly spaced around the sleep sack. 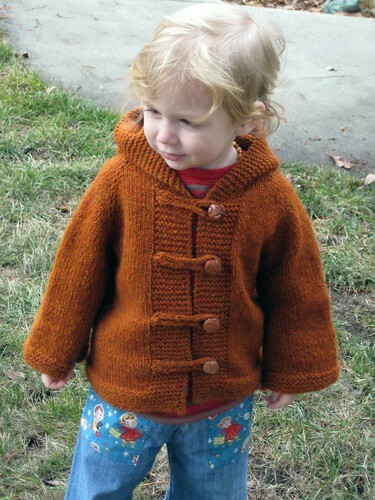 now you will have 75 sts and are ready for the faux cable pattern. after the faux cables, decrease 3 sts evenly around the sleep sack. now you have 72 sts on your needles and are ready for the bottom ribbing. i picked up these cute little play maps from a mama at the hip holiday market and decided to paint a gang of little wood dolls to go along with them. i don't paint often, but it was a lot of fun! 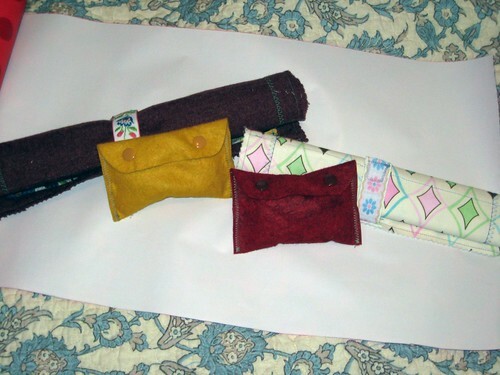 here they are neatly rolled up with the wool felt pouches i sewed to hold the wood dolls. harper has discovered that his wood cars navigate nicely on the city map! and here are a couple of esme's handmade gifts for santa- in addition to cookies and chocolate milk (and peppermint bark!) she left these and other surprises around the house for him. it took mr. and mrs. claus quite a bit of time to find them all, but luckily they didn't miss a single one! 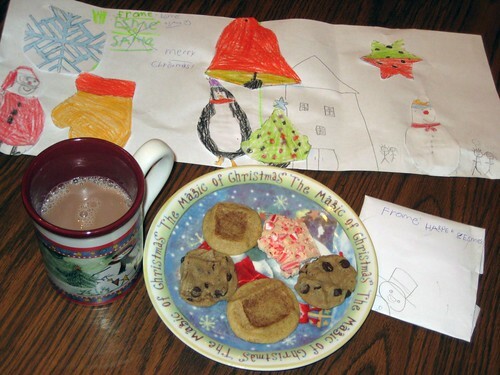 i am sure santa will cherish and hang on to them for a very, very long time! a gift from my super sweet husband... a brand new sewing machine that he actually went out and shopped for with absolutely no help or input from me! he was very unsure about his purchase and offered to take me out shopping to choose another machine, he just wanted me to have something to open on christmas morning. this was actually a machine i had heard great things about- it is a kenmore which is manufactured by janome (LOVE janome machines) and sells for about $100 less than i would pay for it's janome counterpart. i spent a considerable amount of time thinking it over and researching this machine online, as well as a computerized kenmore that was just a bit more money. after reading wonderful things and doing a little test drive i decided to keep this machine. 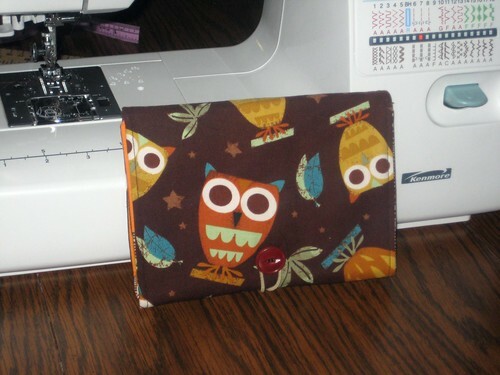 yesterday i broke out one of my very favorite owl prints and stitched up a coloring wallet for a friend's birthday party next week. yes, i am head over heels in love... and i am also pretty fond of my new machine! you did good sweetie! 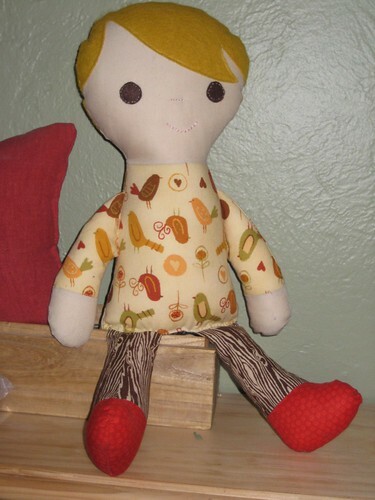 i spent most of my handmade holiday crafting time working on new little friend's for harper and esme. they have been affectionately named sarah and ollie. 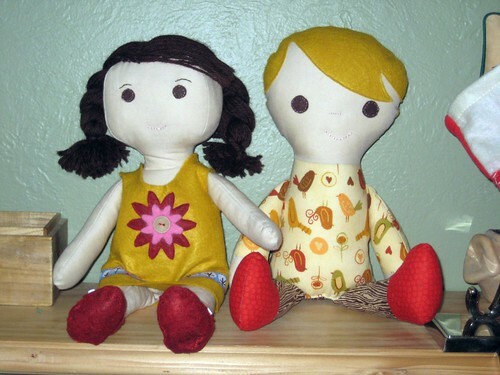 i used this pattern for esme's doll, and this pattern for harper's doll. 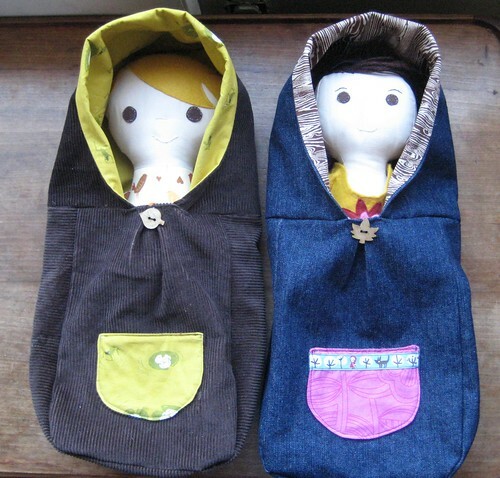 then i decided on a whim to make them each a papoose to carry their new dolls. i wanted something that they would be able to easily get on and off all by themselves. they were pretty easy to make, though i would likely do a dozen things differently next time- making the exterior pocket bigger would be number one. dollies need lots of extra stuff on outings, i am told! i will be back next week to share more of our handmade holiday with you! cookies are baking, handmade gifts are being wrapped, and colorful stockings are hung. 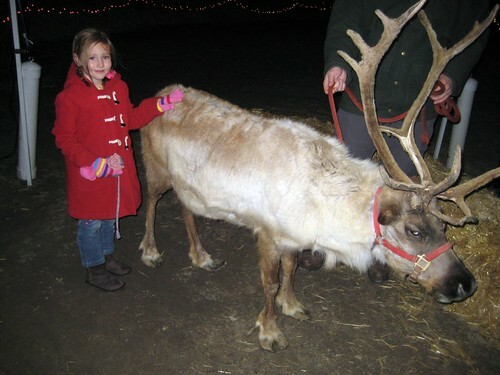 we had a lovely visit with the jolly one and prancer the other evening in his cozy tent at the botanical garden. harper respectfully declined a face to face chat- i assured him that his kind letter that was sent earlier in the week would be perfectly sufficient. esme' put in a good word for him as well. right now... anxious excitement fills the air along with the sweet smell of chocolate chip cookies and peppermint candy canes melting into mugs of hot cocoa. folks, we are santa ready! merry and magical holiday blessings, friends! 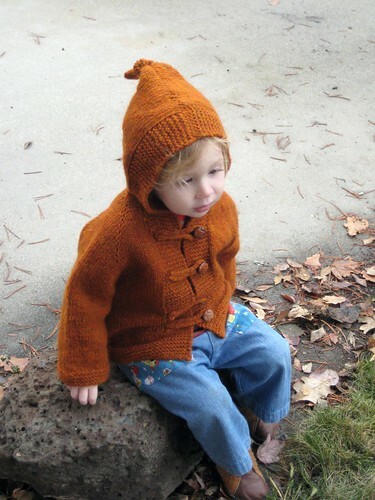 i am so smitten with that little boy in this little sweater! and he seems to actually like wearing the sweater- squeee! 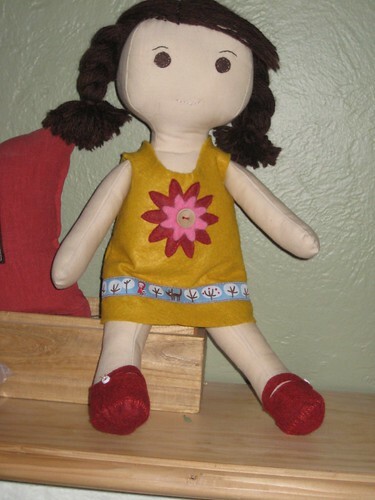 esme's solstice gift is a sewing day with mama where we will finish her doll and they both received new mittens, something we have to continuously replace in our home this time of year. 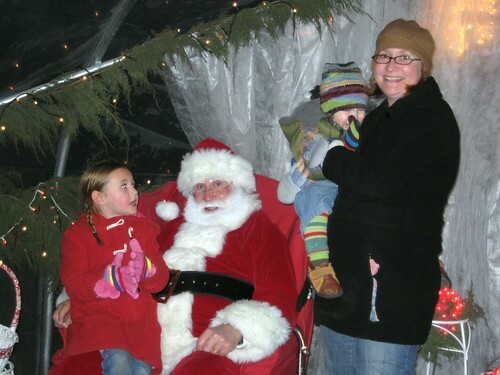 tonight we will be celebrating the season by visiting santa and one of his reindeer and enjoying the beautiful light display at the local botanical garden with some friends. good times with good folks! the pattern is duck soup. i love this pattern and highly recommend it. 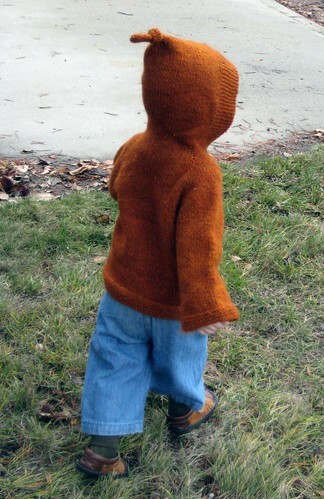 the yarn is peace fleece in the glastnost gold colorway and i knit it on size 9 needles. i did add a few extra increases in the arms to make them a bit more roomy. 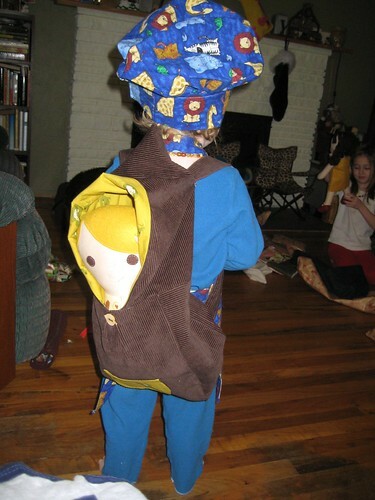 this is the size 2/3 and it fits my little guy quite well! pretty dress, curled hair, fancy shoes and her first christmas program at school. making batches of rice crispy treats for classroom parties. visiting with not one but two good friends who stopped by to say hello. 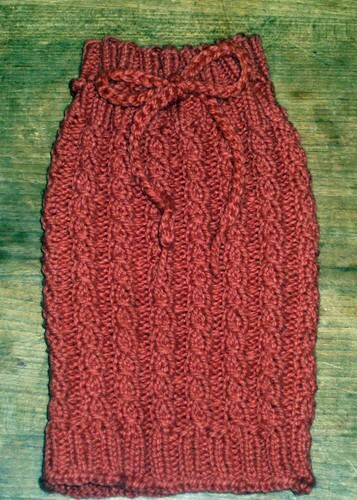 finishing a knitting project, just in time for solstice gifting (photos soon!). 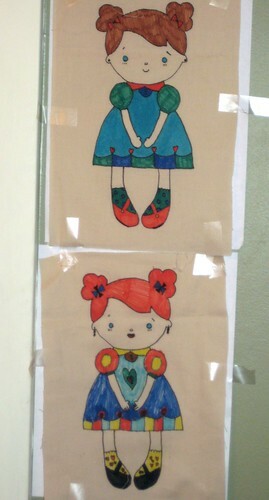 adoring these little doll templates, sweetly colored by my girls. helping niko complete her very first sewing project. stitching esme's artwork into a special gift for her teacher. happy day, friends and good night! the toys were lovingly made, carefully sorted and passed along to their recipients to help complete another handmade holiday! 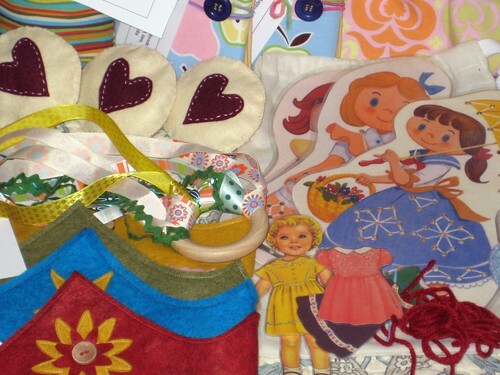 here are some of the wonderful toys that were part of the valley bums 3rd annual handmade toy swap :: stuffed toys, paper dolls, lacing cards, doll quilts, chef hat and apron sets, play food, wool crowns, and much, much more! handmade with love ~ nothing better! i recently made a bunch of these adorable little ornaments for some of my knitting friends. 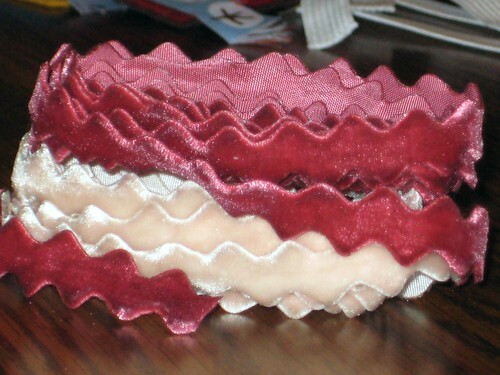 they are so cute and so easy to make! i used scrap wool left over from miscellaneous knitting projects, baker's twine for the tags and plain glass balls purchased at craft warehouse- a box of 12 was $5. 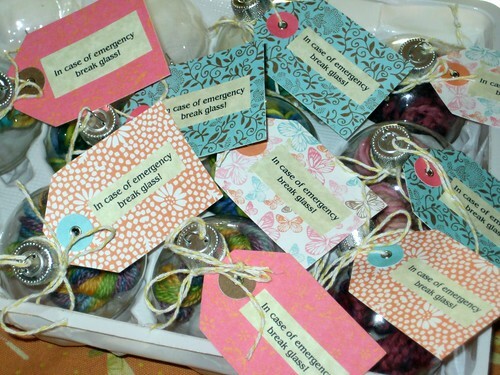 the tags came from target several months ago and i simply glued the little "in case of emergency" sentiment to each one. wind your yarn into a tiny skein (here is a tutorial on how to make a yarn skein) i used the back of a kitchen chair that is approximately 18 inches wide and wrapped the yarn 10 times. 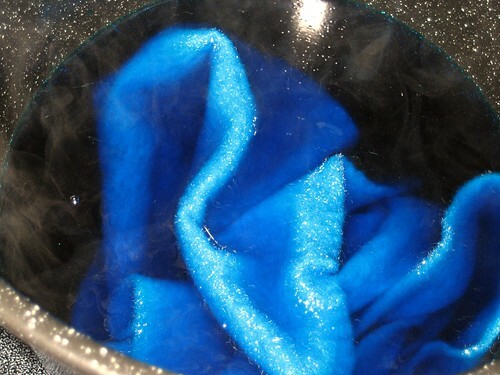 then carefully push the tiny skein into the glass ball using a chopstick or knitting needle. i strongly caution you against using your finger to push the yarn into the ornament. there is often a little sharp piece of glass inside the neck of the ball. go ahead, ask me how i know this!! next, pop the top onto the glass ball, add a cute little homemade tag, and that's it! 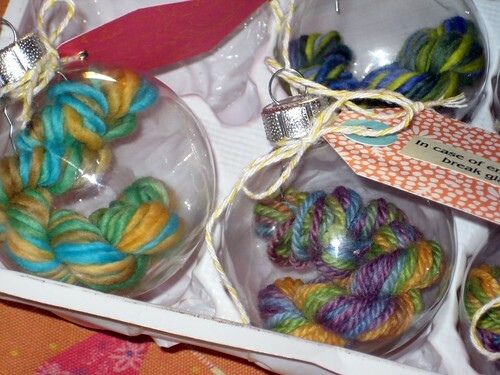 your yarn-y ornament is ready to gift or deck the halls! enjoy! i spent the day at the market yesterday among good friends, many talented artists and delightful holiday shoppers. 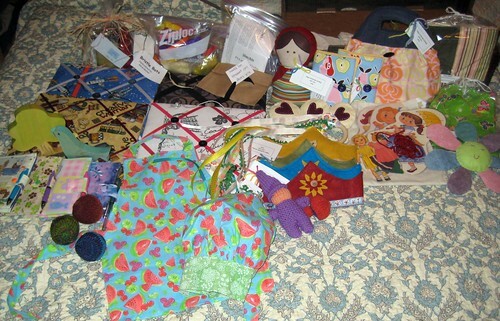 i was lucky enough to trade with some wonderful vendors and came home with a few treasures for myself and family. supporting handmade is a lovely way to spend a saturday, for sure! 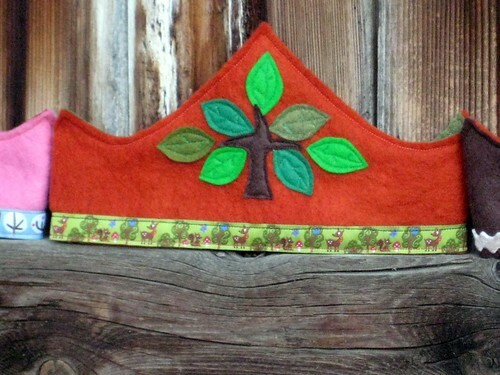 i did come home with a couple monsters, wool crowns, dolls, and coloring wallets that i plan to list in the shop tomorrow. the coloring wallets were very popular and somehow i forgot to take a photo of the stacks of them together before the market which makes me a bit sad. now it is sunday and so far my day has been tea drinking, book reading, and a stitch here and there on my new knitting project. i am trying to ignore the fact that sooner or later (probably sooner!) i will have to buck up and deal with the state of our home due the market crafting craziness that went on here for the past few weeks. but for the rest of today i am content just the way things are in this moment. 'tis the season to give :: it's giveaway day! here is what i have for you! 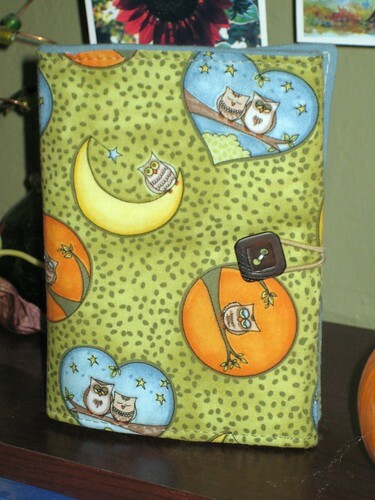 a sweet little coloring wallet in a fun night owl print. 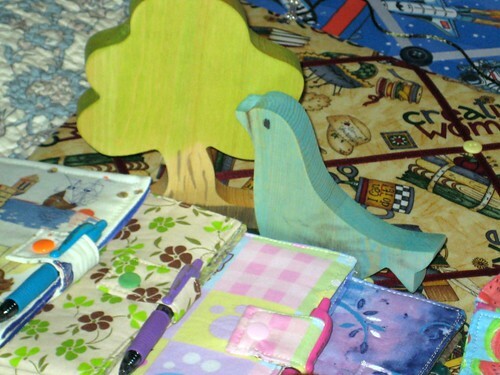 we love coloring wallets for trips to restaurants, appointments... any outing where waiting with kiddos is involved! it features tiny slots for crayons, a holder for a pad of paper, and a pocket in the middle to store works of art. an elastic loop and button keep everything in place. 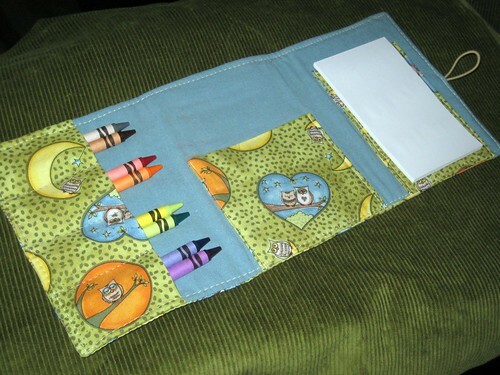 if you know a little artist who would enjoy this coloring wallet, simply leave a comment on this post telling me so. i will choose a winner at random on the evening of december 6th. please make sure i have a way to contact you (e-mail or blog link) in case your name is chosen! at this time i am only able to ship within the US. 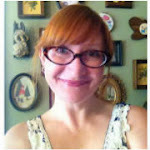 for a list of more fabulous giveaways visit sew, mama, sew! comments are now closed- big thanks to all who visited me for giveaway day!! the winner is commenter #128, mrs. fix! huge congrats!! 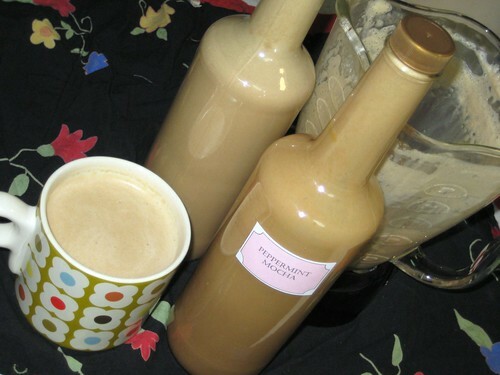 blend, pour into clean bottles, and add liberally to your favorite brewed coffee. i like to use the flavored syrup empties to bottle it up. this will last 2-3 weeks stored in the refrigerator, but come on, who is going to let this sit around that long?! 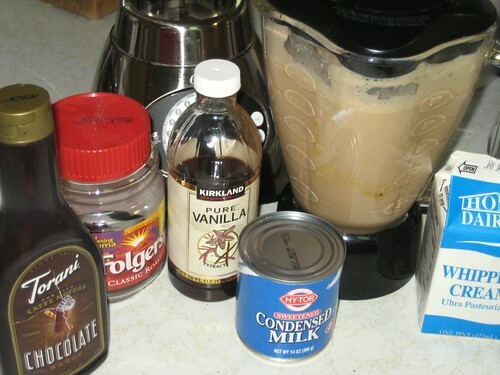 calorically speaking, this stuff is every bit as evil as the store bought flavored creamers, however, this sweet indulgence can be made without a single drop of high fructose corn syrup, depending on what kind of chocolate syrup you use. i couldn't resist making cute little labels for my new love. 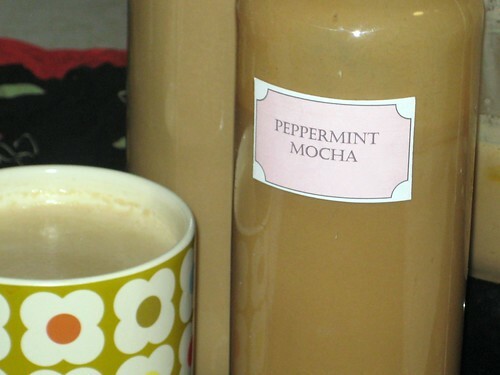 smaller bottles of peppermint mocha would make great gifts, paired with a bag of coffee beans and some biscotti. ah, 'tis the season for all things sweet! happy sipping, friends! 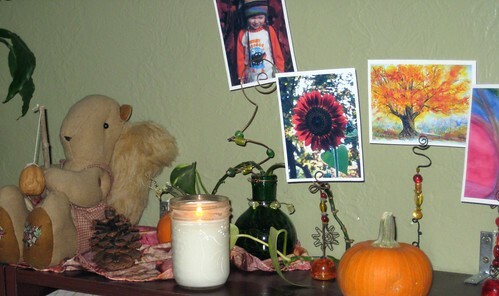 let us give thanks for nature's abundance at this table this evening and for the work of loving hands. 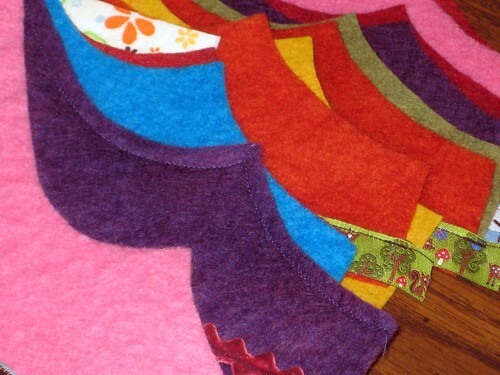 hand dyed wool felt sewn into little bits of wonderful! 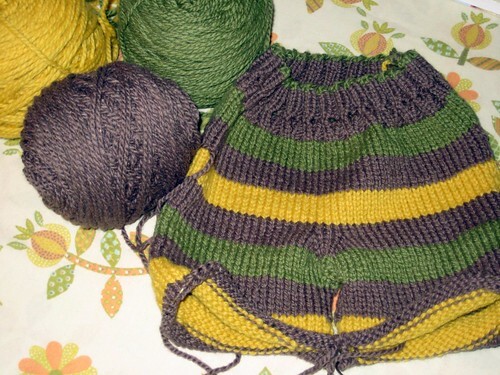 new baby knitting... in STRIPES! 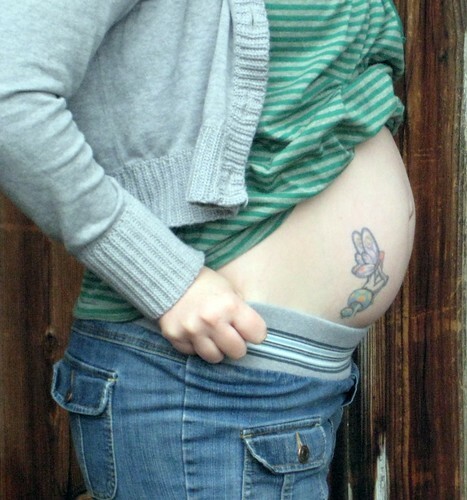 and quite possibly the very best part of my weekend, strong little baby kicks felt from inside. yes, i think baby is smitten with the stripes too! 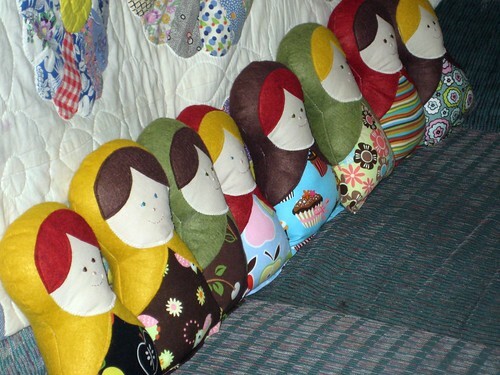 sweet little dolls all lined up and ready for a weekend market! i also managed to assemble four coloring wallets this week. i am especially fond of the horses! 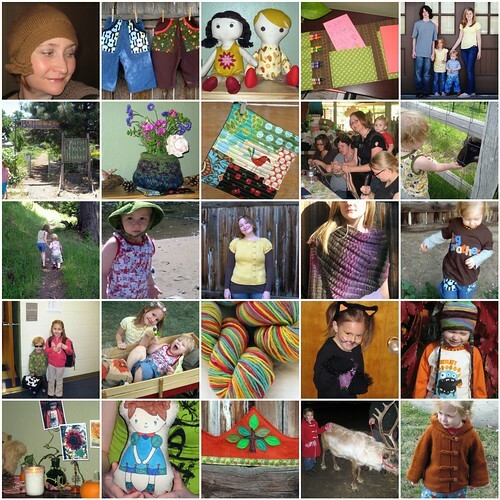 it was another busy week at the handmade workshop! happy friday, friends!